S&P Global Inc. (prior to April 2016 McGraw Hill Financial, Inc., and prior to 2013 McGraw Hill Companies) is an American publicly traded corporation headquartered in New York City. Its primary areas of business are financial information and analytics. It is the parent company of Standard & Poor's, S&P Global Market Intelligence, and S&P Global Platts, and is the majority owner of the S&P Dow Jones Indices joint venture. The predecessor companies of S&P Global have history dating to 1888, when James H. McGraw purchased the American Journal of Railway Appliances. He continued to add further publications, eventually establishing The McGraw Publishing Company in 1899. John A. Hill had also produced several technical and trade publications and in 1902 formed his own business, The Hill Publishing Company. In 1909 both men, having known each other's interests, agreed upon an alliance and combined the book departments of their publishing companies into The McGraw-Hill Book Company. John Hill served as President, with James McGraw as Vice-President. In 1917, the remaining parts of each business were merged into The McGraw-Hill Publishing Company In 1986, McGraw-Hill bought out competitor The Economy Company, then the United States' largest publisher of educational material. The buyout made McGraw-Hill the largest educational publisher in the United States. In 1964, After Hill died, Merged both McGraw-Hill Publishing Company and McGraw-Hill Book Company into McGraw-Hill, Inc. In 1995, McGraw-Hill, Inc. became The McGraw-Hill Companies, Inc. as part of a corporate rebranding. On October 3, 2011, McGraw-Hill announced it was selling its entire television station group to the E. W. Scripps Company for $212 million. The sale was completed on December 30, 2011. It had been involved in broadcasting since 1972, when it purchased four television stations from a division of Time Inc.
On November 26, 2012, McGraw-Hill announced it was selling its entire education division to Apollo Global Management for $2.5 billion. On March 22, 2013, it announced it had completed the sale and the proceeds were for $2.4 billion cash. And name as McGraw-Hill Education. In April 2016, the company announced it was selling J.D. Power & Associates to investment firm XIO Group for $1.1 billion. S&P Global Market Intelligence is a provider of multi-asset class and real-time data, research, and analytics to institutional investors, investment and commercial banks, investment advisors and wealth managers, corporations, and universities. After aquiring a portfolio of diverse companies, McGraw Hill later divested itself of many units to form McGraw Hill Financial which is now S&P Global. The building in New York City has received prominent attention. 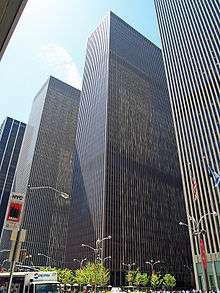 In April 2008, surveillance camera footage was released of Nicholas White, a production manager for BusinessWeek (then published by McGraw-Hill) who was trapped in the building's elevator for 41 hours in October 1999. The McGraws and the George W. Bush/George H. W. Bush family have close ties dating back several generations. According to McGraw-Hill, Barbara Bush is a member of its advisory board. The California Test Bureau division has provided testing material integral to No Child Left Behind, a George W. Bush initiative. 1 2 "McGraw Hill Moves Downtown, Says Goodbye to Namesake Building". The Wall Street Journal. Retrieved 14 July 2015. 1 2 3 4 5 "McGraw-Hill Cos.". Forbes. 1 2 3 "News Release - McGraw Hill Financial". Investor.mhfi.com. Retrieved 2013-10-30. ↑ "About Us: Corporate History: The Foundation". Retrieved May 26, 2007. ↑ "About Us: Corporate History: The Information Age". Retrieved May 26, 2007. ↑ Nick DeSantis (April 6, 2012). "Social-studying network to close". Chronicle of Higher Education. ↑ Himeles, Sara. "Note-sharing site lets students cash in on class notes". Retrieved January 20, 2009. ↑ Sharon. "GradeGuru – notes sharing by students, for students". Retrieved May 9, 2008. ↑ Fabel, Leah. "Growing number of Web sites offer students money for class notes". Retrieved February 5, 2009. ↑ "McGraw-Hill Sells TV Group To Scripps", TVNewsCheck, October 3, 2011. ↑ , "New York Times", November 26, 2012. ↑ "News Release - McGraw Hill Financial". Investor.mhfi.com. Retrieved 2013-10-30. ↑ Staley, Eddie (September 22, 2014). "McGraw Hill Financial To Sell McGraw Hill Construction To Symphony Technology Group For $320M In Cash". Benzinga. Retrieved April 30, 2015. ↑ "McGraw Hill Financial to be renamed 'S&P Global'". fastFT. The Financial Times. February 4, 2016. Retrieved April 26, 2016. ↑ "McGraw Hill Financial Changes Name to S&P Global Inc.". April 27, 2016. Retrieved May 12, 2016. ↑ Beckerman, Josh (April 15, 2016). "McGraw Hill Financial to Sell J.D. Power for $1.1 Billion". The Wall Street Journal. Retrieved April 26, 2016. ↑ "S&P Dow Jones Indices Wins Intellectual Property Dispute". PRNewswire. May 13, 2013. Retrieved 2013-10-30. ↑ Leising, Matthew (Jul 2, 2012). "McGraw-Hill, CME Group Start S&P Dow Jones Indices Venture". Bloomberg. Retrieved 6 December 2013. 1 2 3 4 5 "About Us: Corporate History: Development". Retrieved May 26, 2007. ↑ "Platts History". Archived from the original on May 2, 2007. Retrieved May 26, 2007. 1 2 3 "About Us: Corporate History: Expansion". Retrieved May 26, 2007. ↑ "The McGraw-Hill Companies Timeline". Retrieved 2014-08-23. ↑ Edwin McDowell (September 29, 1988). "McGraw-Hill Is Buying 2 Random House Units". The New York Times. ↑ Iver Peterson (July 4, 1996). "Times Mirror in Two Deals To Bolster Legal Publisher". The New York Times. Retrieved September 1, 2009. ↑ "The McGraw-Hill Companies to Acquire Micropal". Retrieved May 26, 2007. ↑ "The McGraw-Hill Companies Completes Acquisition of Appleton & Lange". Retrieved May 26, 2007. ↑ "The McGraw-Hill Companies To Acquire Tribune Education; Acquisition Strengthens McGraw-Hill Education's Leadership Position". Retrieved May 26, 2007. ↑ "The McGraw-Hill Companies Completes Acquisition of J.D. Power and Associates". Retrieved May 26, 2007. ↑ Monks, Matthew; Scully, Matt. "McGraw Hill Agrees to Buy SNL Financial for $2.23 Billion". Bloomberg.com. Retrieved 2016-01-06. ↑ "Barbara Bush". The Mcgraw-Hill Companies. ↑ "McGraw-Hill & Bush: The Graft and the Twig". School Matter. 4 August 2006. ↑ "McGraw-Hill Federal Credit Union - Home". McGraw-Hill Federal Credit Union. Retrieved 2013-10-30. ↑ "Honor Award". National Building Museum.